When it comes to supercars, the battle between the 2018 Dodge Challenger and 2018 Chevy Camaro continues on today just as it did in the days of legend. Both of these amazing sports coupes have what it takes to keep them as popular today as they were in the late 60’s during the era of the muscle car. The Challenger is considered a 2-door midsize coupe with room for five, the Camaro, on the other hand, is a compact coupe or convertible that seats four. Here we take a look what each vehicle has to offer and what makes the 2018 Dodge Challenger the clear winner. Nothing is more important when it comes to muscle cars than what happens to be hiding under the hood. The 2018 Dodge Challenger starts out at the base end with a 305-horsepower V6 rated at 268 pound-feet of torque. At the upper end of the scale is the massive 707-horsepower supercharged 6.2-liter V8 that cranks out a very impressive 650 pound-feet of torque. Then there is the all-new Demon comes with an 808 horsepower V8 that will literally blow your mind. The Challenger comes with an eight-speed shiftable automatic transmission and is available with your choice of rear-wheel or all-wheel drive. The 2018 Chevy Camaro base engine is 275-horsepower 2.0-liter inline four-cylinder engine rated at 295 pound-feet of torque. The best the Camaro has to offer is a supercharged 6.2-liter V8 that is rated at 650 horsepower, which is a whopping 57 horsepower less than the Challenger or 158 horsepower less than the Demon. From base Challenger to Demon, the 2018 Dodge Challenger comes out the clear winner when it comes to power and performance. The 2018 Dodge Challenger comes equipped with the latest generation Uconnect® infotainment system. Choices include an audio system featuring up to 18 speakers from legendary audio company Harmon Kardon®, Android Auto™ and Apple CarPlay™ compatibility, wireless connectivity for playing your favorite music files or streaming stations, hands-free operation, and a voice-operated navigation system. You also get dual-zone automatic climate control and an endless array of upgrades including heated front seats, an upgraded 8.4-inch touchscreen, interior ambient lighting, an Alpine audio system, and leather upholstery. The SRT Demon is making its mark in the books as being the most powerful stock muscle car in history with its massive 808 horsepower engine pumping out 717 pound-feet of torque (840 hp and 770 lb-ft of torque on 100-octane racing fuel). This version has been designed for the drag strip and comes with street-legal drag slicks, upgraded cooling systems, a custom adaptive suspension with drag mode, and a transbrake that helps you develop maximum power at launch. 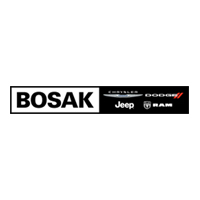 The facts look great on paper, but if you really want to see what the 2018 Dodge Challenger is really all about, you need to come into Bosak CDJR and see one for yourself. We carry an extensive selection for you to choose from. Let our sales specialists answer your questions and then let you take the model of your choice for a test drive. Come in today, but be ready to drive home in your new 2018 Dodge Challenger, we know you won’t be able to resist once you drive one!